The name RE:P is actually an acronym for the name Real Elemental Practise. It's a Neogen's sister brand and the only kbeauty line with Leaping Bunny Certificate - if you want to find this brand you might actually want to type Outin Futures since the parent brand has a certificate for all their lines including Neogen Dermalogy & Code 9 but I think that only on RE:P's products you can find the certificate on the packaging. 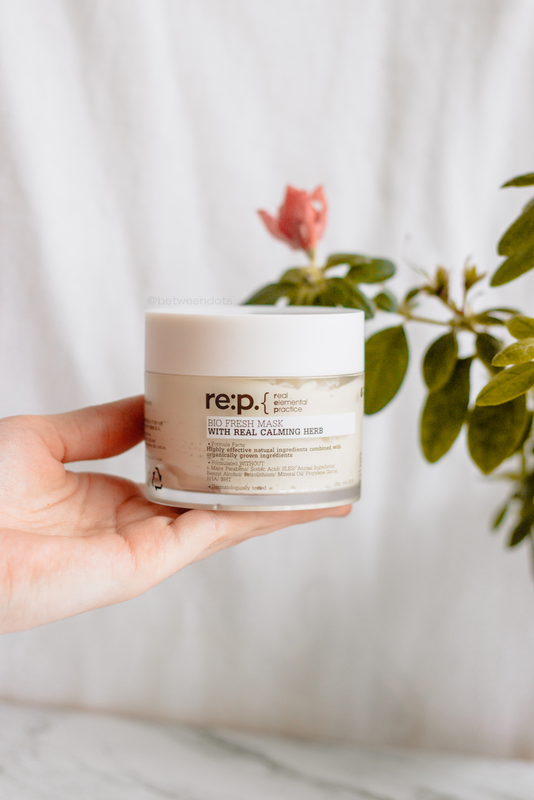 The main idea of this brand is to make products that are similar to nature without making any harm so it shouldn't surprise you that the brand decided to remove parabens, benzyl alcohol or BHT from products. I wanted to try RE:P for a long time so when I found out that the brand is going to be available in Europe, I've decided to stick to European shops instead of ordering it from Sokoglam or Ebay. I was so excited that I grabbed 4 other products on sale but this mask is actually the last product I've tried. I didn't have enough time to introduce other products from this line to you, I feel that I only mentioned RE:P Gentle Face Cleaning Remover Pad in my post called Cosmetics at work? which was really helpful but on the other hand, removing eye makeup with them was really painful for me. But this mask is a holy grail which I feel like if I would make a ranking of face masks it could dethrone The Body Shop Chinese Ginseng & Rice Clarifying Polishing Mask. But what's so amazing that I like many other skincare lovers - let's clarify kbeauty skincare lovers are so obsessed with this brand? It's all about ingredients! The base for this mask is Kaolin which is actually a base for many other face masks - even DIY masks. It's a good absorbent and calming ingredient with antiseptic properties. Even if Kaolin is a base, still Calendula is the main star of this composition since we will find here Flower Extract, Flower Water or even pieces of flowers which you can easily feel them in the texture of the mask. Calendula is an antioxidant which for me is one of the plants that you can find in traditional medicine. It has antibacterial and antiseptic properties that can be really helpful for acne-prone skin but it can actually boost wound healing and calm the skin after irritation. It's quite rare to be allergic to Calendula that's why this ingredient is so popular in skincare. The good thing is that Calendula is mixed with Anthemis Nobilis Flower Water and Flower Powder - it's nothing else than Chamomile which I think I can smell here too. I feel like everyone knows this ingredient a lot and I shouldn't even mention how calming it can be. There's also Symphytum Officinale (Comfrey) Leaf Extract which has benefits for the acne-prone skin. And I could mention all the amazing herbs and how they work way-way longer but I've decided that this time I'm going to show you ingredients for you to see the whole nature of the product. It's not a surprise since some Neogen's products like Neogen Code9 Glacial Magic Pore Mask is also full of natural extract which actually might not be good for every skin type and if your skin is very sensitive - make a patch test first, for me, it worked well but it doesn't mean that your skin will react the same. There will be some controversies since EWG rating of this mask is not as high as CIR rating and I personally do not believe EWG in 100%. Although I'm still not a fan of Phenoxyethanol. I believe that scent used in this mask is made of natural and safe ingredients but I have to mention that there are some ingredients which might not make your skin happy if you've got acne-prone skin like Stearic Acid, Glyceryl Stearate SE or Hydrogenated Vegetable Oil, personally I'm very sensitive to the 2 of them and I had no bad reaction to the mask but as I said before - IT'S A PERSONAL THING. But let's open this mask and look how it works! The scent reminds me of herbal tea which is really pleasing and calming. The texture is rich, I can see pieces of Chamomile and Calendula and it's really pleasing. A small amount of mask is enough to cover my face and neck. According to the instruction, I should leave this mask on my face for 10 minutes but I usually leave it for even over 20 minutes because it's really calming and this scent makes me relaxed. Removing the mask from the face is neither hard nor easy, it's a creamy formula with texture, it's not harsh and the peeling properties are very mild. It looks a little bit like yoghurt mixed with tahini. My skin is very sensitive lately and this mask does work well on my skin. The only thing that I can complain is packaging which is ideal to use is later as a jar for cotton pads soaked in the toner but after my problems with Dr.Jart+ Cicapair Tiger Grass Color Correcting Treatment I feel like plastic is safer than glass. It's not the only mask from this brand - there are two other versions of masks - Vitality Mask and Nutrition Mask, I wasn't able to get them yet but for sure one day they'll be mine. But where you can find this version of the mask? Check Sokoglam (US) or Honeysu. How do you like this mask? Do you know RE:P? Do you know any Kbeauty Cruelty-Free or Vegan brands?